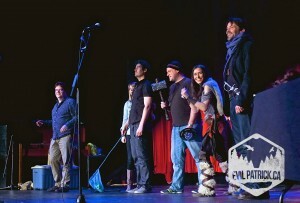 Want to win free passes to the May 15th Critical Hit Show? Like to draw? Then READ ON! As you may or may not know, Edda the Elf Barbarian (who is also a werewolf), had a liaison with Businessman/Treasure Hunter/Rocketeer Max Falcon (Billy Campbell Himself)! The result was a pair of adorable puppies. If you missed the April 24th show, here’s a video of the… er… blessed event. What we’d like from you is an artistic interpretation of Edda and Max’s babies. Remember, they’re part Elf, part Werewolf, part human, and their parents are Barbarian/Treasure Hunter/Businessman/Rocketeer folk. Mash that goodness all together and either Tweet your drawing to us (we’re @critshow) with the hashtag #eddaspuppies, or tag us in a Facebook post. The winner gets a pair of comps to our May 15th show, and their winning drawing gets put up on our pre-show slide show for all to see! There is no maximum number of entries. So get your pencils, pens, tablets, macaroni and glue, and get to work! The Deadline is Monday, May 13 at 11:59pm!